This is the third part of my blog series on regular expressions. In the first two parts I introduced basic and complex regular expressions. Now it is time to use them in practice. This post will show you how to use regular expressions in search and replace operations. The upcoming parts will explain the usage of regular expressions in multiple programming languages. Assume you want to change the date format to mm/dd/yyyy. That is a task where regular expression excel. I chose to use Visual Studio Code for these type of problems. The standard search window offers regular expressions. Just activate them by clicking the marked symbol in the screenshot. As you can see I limited the possible year range from 1900 to 2099 as I am fairly certain that my document won't contain any dates outside that range. The following screenshot shows I my RegEx worked in Visual Studio Code. The regular expression matched all the dates in the .json file. To change the date format you need to replace the matches with other content. 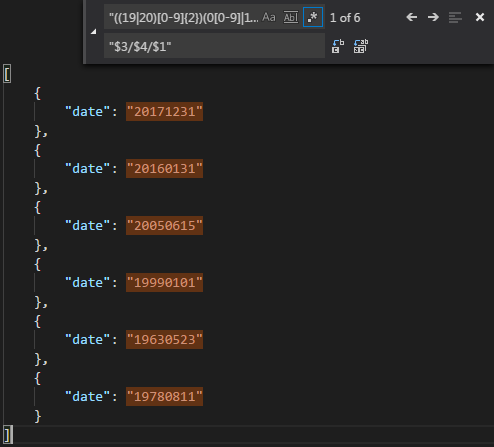 But since you want to reuse the existing date you have to reference the groups (or submatches). You can do this with the dollar sign ($). A great way to test if you replace strategy works is an online RegEx editor like regexr.com. It offers several tools including a replace tool. The following screenshot shows my replacement strategy. As you can see in the picture the replacement works. I reference the groups 1, 3 and 4 to get the year, the month and the date. Now I can use this replacement strategy to edit my .json file. See how Visual Studio Code executes the replacement. With this knowledge you can speed up a lot of tasks involving large text files without a single line of code. This conclude the first post about regular expressions in practice. If you have any ideas on how to improve this post just leave a comment or tweet at me.